Barry at breakfast told us his life story, nice guy who’d had some bad knocks which had really affected him. Hope your new venture works out Barry. I chatted to the American couple before we paid and loaded up with Barry supervising and stoking up his pipe. We cycled in breaking sunshine out of Killin alongside the shores of Loch Tay it was hilly but great views and interesting looking at the Mountains Ben Law with snow atop of Ben Law. We passed the old crofters cottages abandoned during the Highland clearances. Colin all week was trying to lose his seat cover but as it fell a local farmer sounded his quad bike horn telling him he’d dropped it. I picked it up for him also later that week. 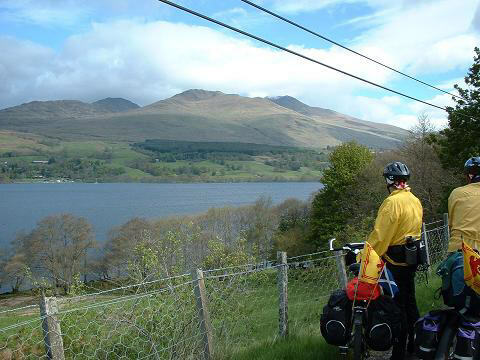 The views were magnificent as we cycled past Acharn we called in to Tay Cycles for our next stamping station Colin had to repair her stamp machine. Kenmore café stop £7.65p for 3 coffees and 3 pieces of cake at a self serve café? I even forgot to go to the toilet Jane if you are reading this can you believe that? We cycled down the Tay valley through lush farmland very different to the mountains. A slight detour into Aberfeldy the Home of the Black Watch a visit to the Tourist Information centre pin badge and a stamping station I even had to fill in a questionnaire. This cycle route is a lot more switched on and even the stamping stations are expecting you. 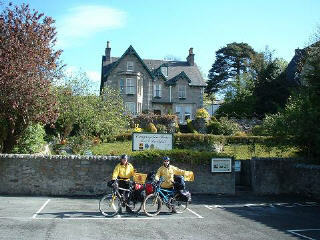 We cycled back to the route and followed it downhill through another pretty village Strathtay and another stamping stop at the Spar shop. We followed the valley down through a small village called Balnaguard which is halfway another milestone down to Logierait and we hit the hills up and over to Pitlochry tough going after a 15 mile downhill glide. The chap strimming halfway up the hill didn’t help either? 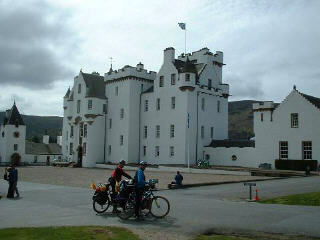 Up to Lochraig there was slight detour up steps asking cyclists to walk. Colin actually rode up the steps to the top!! Trick cyclist or circus act. I think the bike tips it towards a circus act. As we climbed over the hill to drop down to Pitlochry I got a puncture, it’s always me. Colin fixed it in minutes whipping in another tube. We had a steady ride into Pitlochry an uphill climb to find the digs following the street plan when we could have approached off the main road, but great digs, Colin and Graeme another bay window with a view of the valley. Pitlochry was a strange town quiet, but we had a wonderful Indian meal even helped some Dutch tourists with their order. And then a couple of the worst pints of beer and worst service ever. First bar barman suggested I shouldn’t order a particular drink? Second bar £2.70p a pint what!!!!!!!!!!!! !Some kettle stuff which was dreadful to drink too. When we went down to Breakfast, the landlord at Craigroyston guest house warned us of the climb over Drumochter, but we are the Multidaymen. We had a good breakfast and some fun with Australian tourists who wanted their pics taken together, she had got frustrated with the waitress who hadn’t taken the pic properly I volunteered hope they came out ok, the lady had a very complicated camera. We loaded up after breakfast paid our bills and we were ready for the Dromochter Pass but first the pass of Killiecrankie. Then Killicrankie visitor centre bought a badge toilet stop it was also a stamping station Staffed by two miserable females who were unhelpful to say the least. We pushed on, just down the road we encountered walkers spread out over a couple of miles all dressed in Tartan and football scarves we later discovered it was Inverness Caledonian Thistle supporters clubs Highland march to Falkirk to watch the last game of the season. Graeme thought they were still retreating from Culloden. Cycled into Blair Athol stoked up and bought sandwiches and drink ready for the climb, we did a slight detour up the driveway to Blair Athol castle it was a fair pull up hill Graeme got there first, as we cycled up I noticed it was £2 into the grounds I said I’m not paying £2 for the privilege of cycling uphill. Anyway as we got to the Gatehouse he was laughing with a fella with a Durham accent, the Gateman was from South Shields he shouted ANYMOOOOOR for SPENNYMOOOR we called him a Sandancer ,The anymore was what the buses used to shout and a Sand dancer is a person from Shields. us Durham lads stick together. Photo stop and a mooch round then back down through the grounds and on our way, quiet flat roads up to a village called Calvine and the start of the off road section over the pass. 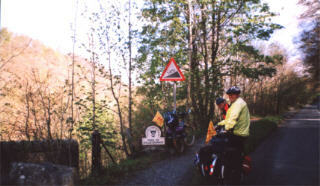 We stopped to note the Drum sculpture a sustrans commission and the warning signs about the exposed route ahead. Graeme said it would be better if they’d built shelters across the route, I felt it was a good point. We stated to climb very steadily it was just a slow steady slog to the summit, we stopped every so often and kept checking the map which wasn’t greatly accurate on this stretch, we stopped just short of the summit in a lay by for food and Graeme’s cure all his hot chocolate. A Dustcart pulled up as we ate, were we tempted to hand him our bikes NO? The track had been like cycling in treacle a dressing of grit over the track made it very tough to cycle through. 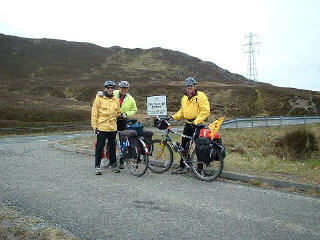 Colin went a little nuts at this point and pushed his bike across to the main sign over the A9 and then ran back wanting his bike against the summit sign, Hard luck Colin for when I set the timer to get all 3 of us in someone had pushed another bike into shot across and hid his bike? We were now rewarded with a downhill descent to Dalwhinnie about 3 or 4 miles of steady dropping down to the Ben Alder Café past workmen who were just on upgrading the cycle track. Good for them. The Ben Alder café another stamping station plus in there we must have looked cold and hungry, a lady on the next table recommended the soup it was tomato and vegetable with crusty bread excellent and filling. 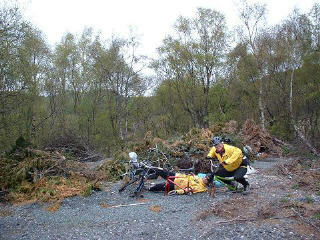 It was then downhill to Newtonmore steady drop on the old A9 and a cycle track to Newtonmore stopped to take a photo of some abandoned bikes which caused great amusement since they were at the foot of the Drumochter Pass. For any cyclist reading this the Drumochter is just a slow grind over barren countryside, nothing alarming as we were led to believe!! And to Newtonmore and The Pines Guest house and our hosts for the evening Colin and Pam from Brighton..
Newtonmore is the town they use for Monarch of the Glen. We had a very pleasant evening in the Glen hotel, proper food well priced and decent ale. A walk round the town back to the Glen for a nightcap and then crashed out.